School of Rock is the original performance-based music school founded in 1998 in Philadelphia. With over 30,000 enrolled students and a strong internationally recognized brand, School of Rock is the largest after-school music education provider. The School of Rock instructor creates a safe and cool environment for students to achieve their musical and creative potential, guiding them through an exceptional journey on stage and in life. 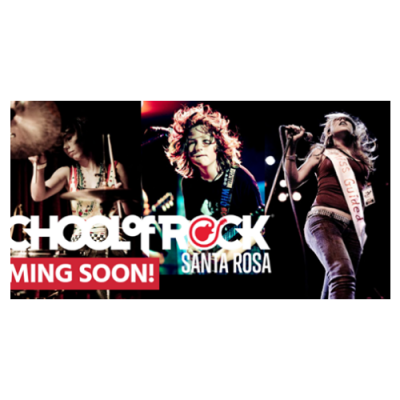 School of Rock Santa Rosa is under construction and we are looking for a diverse team of Music Instructors to provide the very best playing and learning experience. Together we will share our love of music to educate and coach the musician that resides in each of our students. • You passionately teach Bass, Drums, Guitar, Piano/Keys, and/or Vocal – the more the better. • Working/gigging musician with formal music training. • Solid knowledge of music theory and technique with an ability to collaborate on curriculum design. • 4+ years experience teaching and/or performing music professionally. • Excited to work with kids aged 5- 18 as well as adults. You ooze enthusiasm, inspiration, and patience. • Excellent people skills dealing with a wide variety of ages and personality types. • Team-player – you’ll cheerfully jump in and help. • You want to help build a new community through School of Rock’s mission that we “Play to Learn”. • You have sound judgment, are detail oriented, flexible, and very reliable. We value individuality and diversity in all things and honor everyone where they are. All positions at this time are part-time and flexible. This will allow our instructors to go out on regular gigs and/or tour and have work to return to. School of Rock Santa Rosa will be a haven for aspiring musicians embracing a variety of musical genres, songwriting, and performing. We believe live performance is the most fun and effective way to teach and we will get our students playing on stage as quickly as possible. Classes are tailored to all age groups and levels of proficiency, and our instructors will be key in creating a legacy by helping students succeed in music and beyond. Because music is more than a solo act we will teach both kids and adults to play as part of a team. This promotes accountability, speeds up the learning process, and fosters creative collaboration. Students are not only learning an instrument, they’re making friends, building confidence, and becoming better people who will mentor those that come after them. • Maximize the quality of music instruction in private lessons and group rehearsals. • Be sure the students are learning the fundamentals of music, not just songs. • Assist in the creation and documentation of thoughtful lesson plans. • Communicate regularly with parents on the progress of students after lessons. • Interact with parents and students regularly by being visible and accessible in the school. • Pitch in around the school when not actively teaching. In addition to your resume please let us know via email at santarosa@schoolofrock.com the qualities that make you an exceptional candidate. If you teach instruments other than those listed above, have sound engineering experience, or enjoy directing shows let us know. Also, feel free to include links that show you performing, your personal or band website, and/or your social media.